Put students into groups and use a jigsaw approach to reduce the amount of time this EET chapter would take to complete. Activity is based on a case study of where the missing carbon is in the Earth's carbon cycle. Scientific uncertainty in overall knowledge about the total global carbon cycle may be overstated in activity. The scientific community knows a lot about the carbon cycle, its fluxes, its sources and sinks - the activity implies that the scientific community doesn't know a lot - in fact, only a small fraction of the total global carbon cycle is unaccounted for. 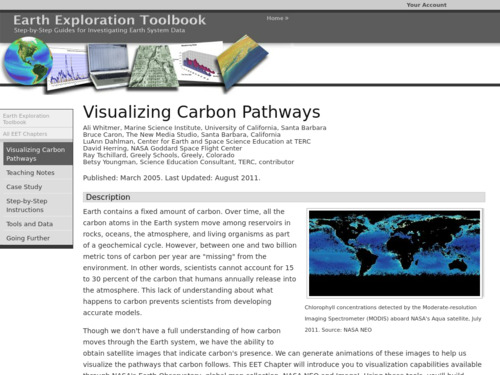 Activity focuses on the annual cycles of the vegetation/ocean part of the carbon cycle and does not address other sources, sinks and time scales in detail. Comments from expert scientist: This activity is based on the same data that climate scientists use from public repositories provided by NASA. It gives students an accurate representation of the same work that climate scientists use on a daily basis. Very dense but extremely well scaffolded activity. Students may have difficulty with one of the most important learning standards e.g. describe evidence for carbon's movement through the Earth system. The instructor will need to think carefully about how to assess students' understanding of their analysis of the visualizations, the relationships among three sets of data, and carbon pathways in the carbon cycle. Websites linked to from activity have changed so some of the tools and practice activities are not currently available - could be updated fairly easily by someone at TERC but is it worth the time and effort. Requires a bank of computers. Must download the free Image J software.